The cliché about the suburbs, especially those south of the river, is that there’s nowhere good to eat. That’s not quite true anymore, if it ever was, especially as London’s property crisis and the increasingly brutal restaurant market push more and more restaurateurs further out from the West End and other traditional areas for dining out. But it’s still very easy to have a bad meal in the ‘burbs and nowhere is that more true than Blue’s Smokehouse. Sorry Snaggletooth. You can blame Happy Buddha for recommending this place to me. 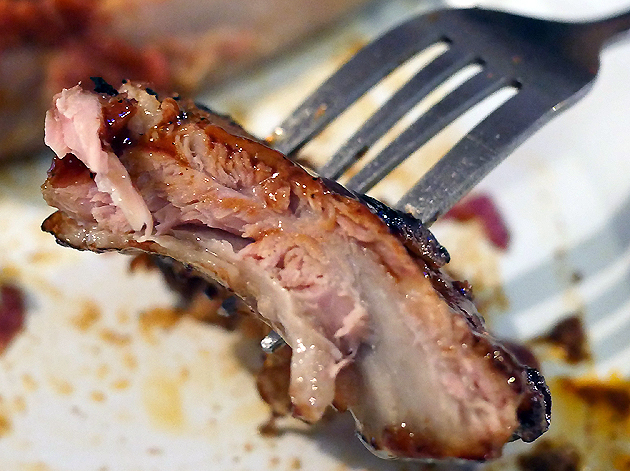 This mini-chain of barbecue restaurants has a few branches dotted here and there. Knowing nothing about Blue’s or Twickenham, other than the latter’s reputation for rugby, I had some hope that this meal would be half-way decent. Twickenham’s high street has more than its fair share of seemingly independent restaurants and small chains, avoiding some of the identikit megabrands that have bland-ified so many high streets up and down the country. The cheesy interior, blanketed in chintzy Americana, didn’t inspire confidence. What followed on the plate was even worse. 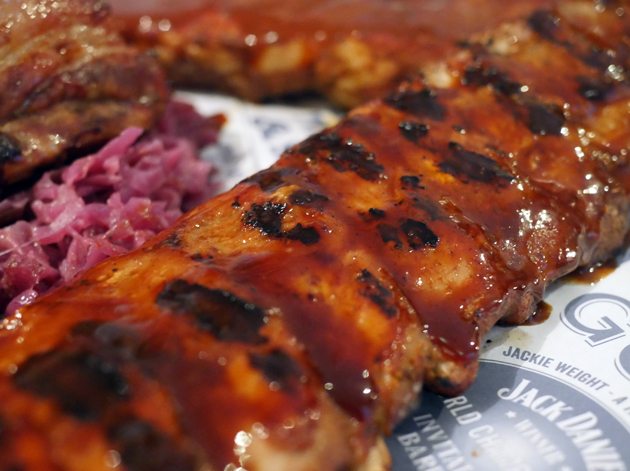 The baby back ribs weren’t just below average, but were actively revolting with its oddly sour sauce. The meagre rib meat would’ve been better off without it, even if this would’ve reduced its already limited appeal to that of a mouldy rice cake. 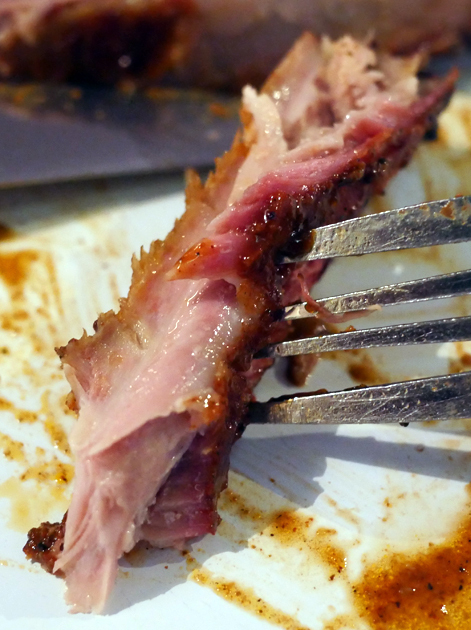 It’s a sad state affairs when a restaurant’s baby back ribs taste worse than a McDonald’s Pork McRib. 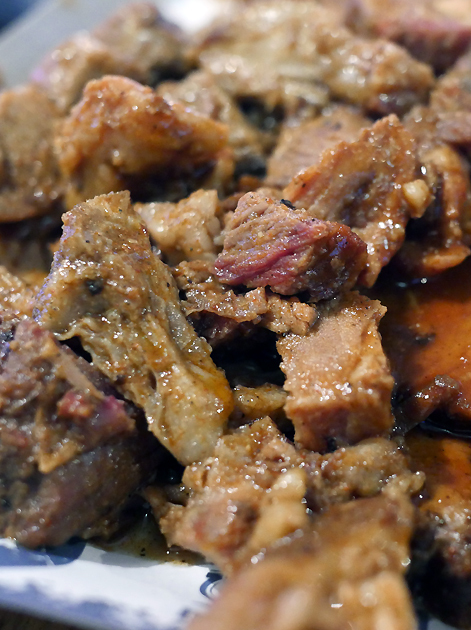 Moderately dense burnt ends started off with a modest hit of salt, before settling into an excessively soft and bland rut. 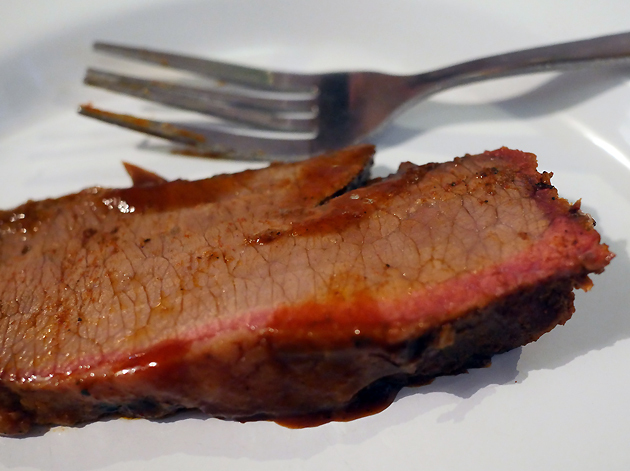 Slices of beef brisket were only moderately moist and tender, blighted further by having none of the salt, smoke, rub-flavoured bark or rendered fat and connective tissue that I would expect from proper barbecued beef brisket. People have to be warned. It takes a special kind of kitchen to make pork belly, a cut of pig naturally blessed with flavoursome fat, dull and uninteresting. But the belly here was nothing more than a hard breeze block of lifeless white meat topped with a solid slab of fat that hadn’t been rendered at all. While it didn’t require the same amount of shoulder-wrenching hacksawing to cut as the even worse cuts of meat at the truly diabolical Low, Slow and Juke, it was still far from the yieldingly moist hunk of pig that it should’ve been. 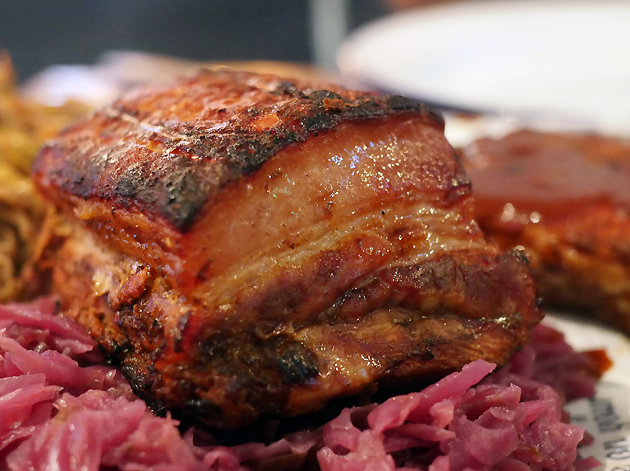 Half-decent gastropub kitchens can manage what Blue’s kitchen could not. If you’re superficial enough to think something taste’s good merely because it looks good, then this is the placebo for you. 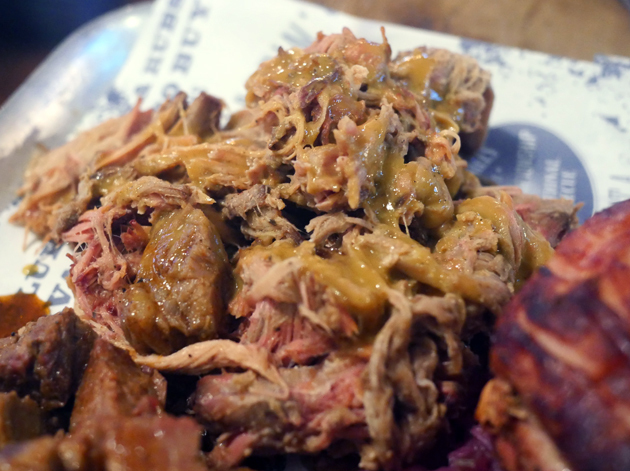 The less said about the bone-dry, grey-tasting pulled pork the better. The St Louis-cut spare ribs was the one cut of smoked meat here that wasn’t soul-sappingly mediocre or ashes-in-your-mouth bad. 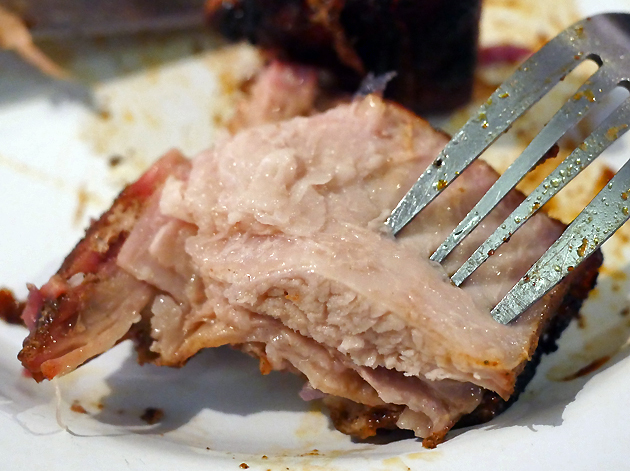 It had a mildly porky, ham-like taste to it, but there was surprisingly little fat, a non-existent bark, only a modestly tender bite and little depth of character. Stick a fork in me, I’m close to done with this hole. Snaggletooth, my dining companion for this pale shadow of a meal, was just as unimpressed with the meat as I was – despite having eaten at far fewer American-style barbecue restaurants. He was perhaps attempting to salvage something from his trip to zone 5 by claiming to like the Daim pie. 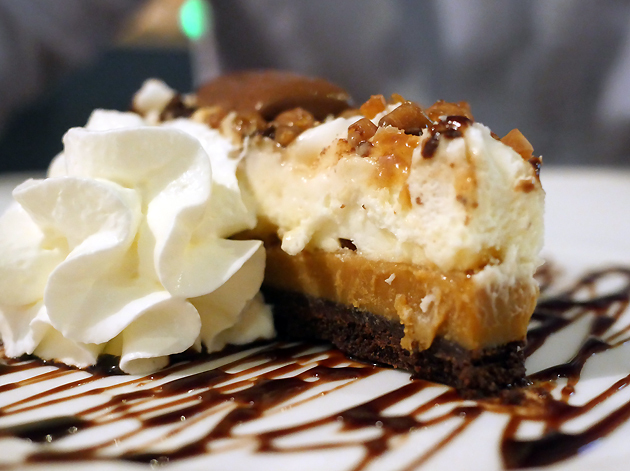 While identifiable as a homage to the classic chocolate bar, the majority of this dessert appeared to be an ejaculate of various lifeless creams. Blue’s Smokehouse allegedly sources its gelato from Joe Delucci’s, which would explain the underwhelming impression it left. 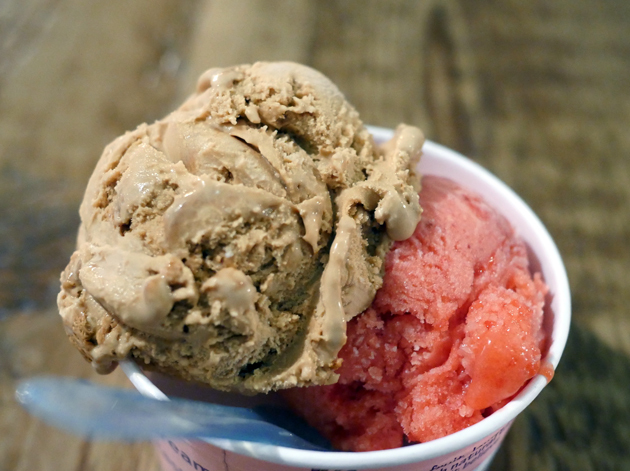 Both gelati I tried were moderately smooth, but weren’t anywhere as elastic or as dense as they should’ve been. The dulce de leche flavour had a very mild caramel-ishness, while the raspberry was generically sweet with little of the sharpness that would’ve made it truer to the fruit. This review’s procrastination was brought to you, in part, by the Your Name soundtrack. 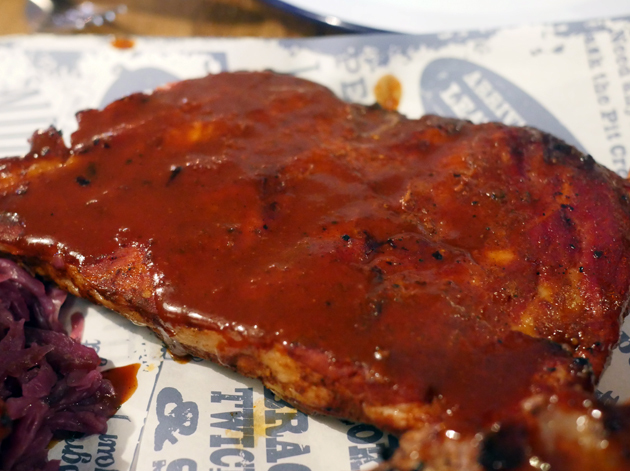 While the barbecue at Blue’s Smokehouse wasn’t as misbegottenly unedible as the dreck served at Low, Slow and Juke, it was bad enough that I felt it necessary to apologise to Snaggletooth for dragging him out so far from home for so little gain. The wantonly indiscriminate, as well as the naively inexperienced, will probably lap up Blue’s third-rate fare without a second thought. It is perhaps unrealistic to expect a suburban chain restaurant to match the best barbecue that London has to offer, given difficulties in attracting kitchen talent, a centrally dictated supply chain where excellence is a low priority and a location highly dependent on weekend and event trade that values quantity over quality. But BBQ Whisky Beer (since rebranded as Smok’d) in nearby Kingston shows that crass exploitation doesn’t have to be the case. While far from the standard-setter it once was, it still manages to serve up a better standard of barbecue than this limp, lazy, uninspiringly cynical hole. Total cost for one person including soft drinks (when shared between two) but excluding tip: £30 approx. 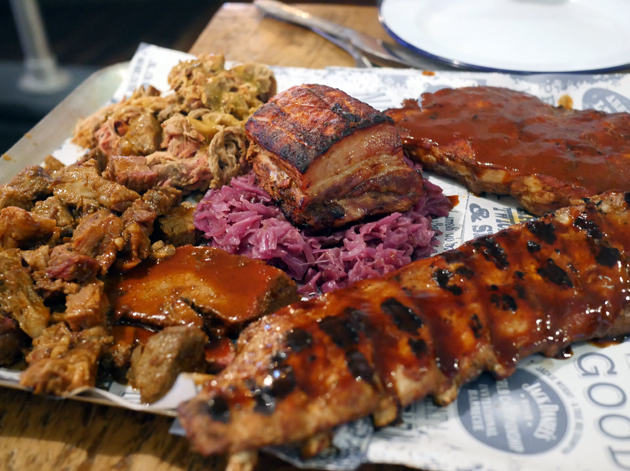 Tags: barbecue, bbq, beef brisket, blue's smokehouse, burnt ends, gelato, joe delucci's, london, pie, pork belly, pulled pork, restaurant, review, ribs. Bookmark the permalink.